Hottly tipped as the designer of choice for Kate Middleton's wedding dress, Sarah Burton has now fully instated herself as the designer of the moment. But is Kate Middleton's choice all that surprising? Given as though she is determined to create herself as a British fashion protogee with a quirky taste it seems that a McQueen gown would work. It is also worth remembering he relationship between Lee McQueen and her late-mother-in-law-to-be, Diana Princess of Wales. Burton is no stranger to dressing big names, her premier solo collection in Paris last week has already adorned people such as Michelle Obama, above. She was also commissioned to make several pieces for both Samantha Cameron and Sarah Brown in the run up to last year's election. Her dresses are known to command attention, yet remain elegant - and it is this elegance that is believed to have been so important from keeping Alexander McQueen from turning into another Vivienne Westwood whilst Lee was alive. 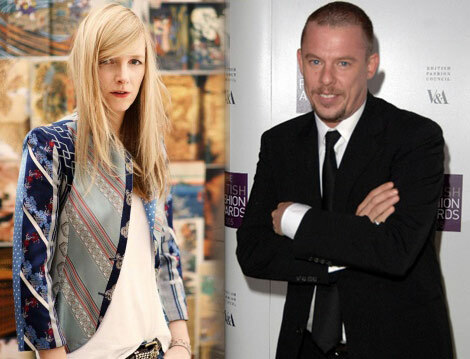 McQueen's premier wedding commission was for Sarah Buys, when she wed Tom Parker Bowles in 2005. The piece, rumoured to have cost £10,000 and heavily influenced by Burton's feminine touch - demonstrated that Alexander McQueen was a versatile brand suitable for any occasion - the dress is above. One of the guests, a young Kate Middleton, may have taken inspiration from this... A second commission followed for Vogue journalist Plum Sykes, below. But what will the dress look like!? Burton's first collection without McQueen premiered last week, and had a decidedly gothic/ bohemian fairy tale-ish theme - so will the dress have the same style? The more you think about it, the more genial it is that McQueen's label could be designing the most important dress so far this century. A true British talent, who spiralled through a life of drink, drugs and self torment, can at last be at peace - safe in the knowledge that his label was left in great hands - and his name (as if it wasn't already) will remain in history for all time. 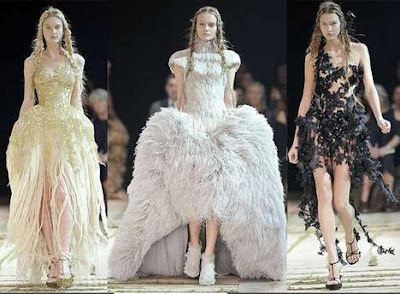 I absolutely would love to see Kate Middleton in a new McQueen gown. I absolutely adored the brand's latest collection. I can't wait to see what it will look like! Great post.